I'd eat his breakfast any day! I love your new category: "Pieces thrown on the floor." Quite appropriate at that age. Okay, I'm going to the corner to pout now. Anyone else without a Thomas plate is free to join me. Good Morning Mummy and Bubba and the rest of the readers of this blog. 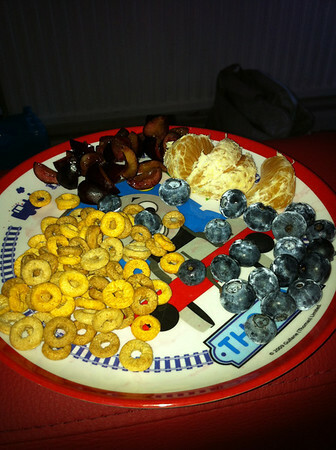 What a lovely breakfast, my Daughter loves blueberries and even went as far as wanting her own blueberry plant. Even now, loads of years later (well not that many), she loves her fruit and loves trying all types. In her garden, she has cherries, strawberries, gooseberries, black berries along with edible flowers and her own herb garden. The funniest thing, she loves going to the garden centre and eating the plants there. I love fruit and vegetables fresh from the garden, too! My Dad always said I was worse than the rabbits at the fresh peas, tomatoes and carrots. Pieces thrown on the floor! That's adorable. How is the price free? I guess you could have grown all the fruit in your own garden, but what about the Cheerios and milk? Also, that's a lot of sugar and very little protein (only some from the milk) for a growing baby. I would put the health rating at about an 8/10. He usually just has cereal and milk for breakfast do I'm not concerned by the protein, he gets plenty in his other meals. I preplan his meals so I can make sure he has a good balance over the whole day, I come from a family and culture where breakfast isn't the most important meal. As for the sugar he gets no other sugar than in his fruit (and a little contained in the Cheerios which are a treat) if I didnt give him any fruit someone would pick up on it and say that child should be eating fruit" I give him fruit because it's healthier than a lot of breakfast foods and he likes it, too many kids are getting to school age not knowing what fruit and veg is I think it's important to introduce as many different kinds of food as early as possible. Right on, Tanya. Yeesh, people. Discussion is lovely, and the conversations are important, but I'm not enjoying how judgmental the tone is getting- especially toward other parents. I don't think it's constructive. She's right. If this breakfast had been protein based, she would have heard about the lack of fruit and veg. I totally agree with you Ruth! Babies Bubba's age only need one serving of meat or alternatives (legumes, eggs, or nuts) a day. Should Tanya, a perfectly capable mother be criticized for choosing to serve it later in the day? Add to that if you look at the Cheerios box there is only 1 gram of sugar in a cup. I doubt Bubba eats a cup of Cheerios for breakfast! Giving college grad students flak for some admittedly poor choices is one thing, giving a mom who is providing a perfectly healthy breakfast for her son is quite another. Let's lay off the judgement shall we! For what it's worth, Cheerios are whole grain (not to be confused with multi-grain, which is basically meaningless) and relatively low in sugar. As such, they are a good complex carb. On CJ's smoothie day, "joeaglesham" wrote: "I think these guidelines that show percentages of different food groups on a plate are a useful guide, but don't need to be followed rigidly over every single meal. It's much more helpful to look at what you eat over a longer period of time, maybe a week..." And I'll happily agree with that.... up to a point. I don't think you are gonna drop over dead if every single meal doesn't exactly follow the recommended guidelines perfectly. But I'd prefer that your meals over the course of a day did, rather than a week. If you eat Twinkies and Friench fries/chips 6 days and then load up on a skinless chicken breast and 3 cups of steamed broccoli on Day 7, that's still nothing close to healthy eating. Sugarwater, I did not "ream" CJ. She knows exactly what I was trying to say about her "four dessert" lunch. (It did not deserve a "9" on the health rating, and it should not be taken as indicative of what the "average American" eats for lunch most days.) Same with her smoothie. (The fact that we all sometimes do things like that does not automatically mean it's a good thing to do.) Neither is viewing lunch as just a "tide me over." Lastly, it's well known that "western diets" have gotten very protein heavy. A sippy cup of milk seems fine as a breakfast source of protein for a 53-week old child. Totally not 10/10 for healthy - more like 7/10. Cheerios are not very nutritious. Too much sugar in fruit, you need more protein on the plate! It's only a handful and I'm sure she gives him more protein in other meals (it's not a major requirement every time). They're all over the place in Louisiana, but I had never even heard of them when I lived in New York. One of the doctors I work for has a few Satsuma trees in her back yard and she brings them in for us all the time, and I also see them in the grocery stores. Maybe you just need to head south? This is a place in Louisiana that will ship them to US locations. Considering this is for a baby of 12 months old, the cup of milk should deliver enough protein to cover the daily recommended amount for the age/average weight, which is about 8g of protein. Breast milk has less protein than a manufactured formula, but over the day the child will get their correct amount & maybe a little more. Blueberries: One cup of blueberries contains 1.1 grams of protein, 84 calories and 3.6 grams of dietary fiber. Along with vitamins and minerals. Cherries: One cup of fresh cherries, with pits (do not eat), contains 1.46 grams of protein, 87 calories and 2.9 grams of dietary fiber. Along with vitamins and minerals. Satsuma: Depending upon the brand/store, these can have up to 1g of protein, along with vitamins and minerals. A diet including plenty of fresh fruit & vegetables helps reduce the risk of heart disease, stroke and some cancers. If there is one thing we have observed over the last few weeks, it is that everybody is concerned about having healthy meals, especially the parents. And based on the culture of a place, the importance given to a meal varies. Some places, it wil be the breakfast, some places it'll be lunch and so on. Also, the age should be taken into account. A college student having fruit for lunch was commented upon since the physical activity is more, metabolism is faster and the food gets digested faster. Even that, when CJ gave the context, made sense. So let's not get judgemental here. I think the idea is to read about the different cultures, food patterns and cuisines. And it's been a lovely experience to read all the posts.